Get the fire roaring, grab yourself a mince pie (or three) and snuggle up in front of the TV. Because whether you’re home alone with your cat or hanging out with friends, now’s the perfect time to binge watch all your favorite Christmas movies. You’ll find hundreds on festive flicks to choose from on your Sky, Netflix and Amazon Prime account throughout December. Settle in for classics like It’s a Wonderful Life and Miracle on 34th Street. Unleash your inner big kid watching The Grinch, Elf and Disney’s The Santa Claus. Or indulge in seasonal chick flicks like The Holiday and Love Actually. In fact, with so many Christmas movies to choose from, your only problem is going to be deciding what one you should watch first. Lucky for you though, we’ve got just the thing to help. To celebrate the release of their new Jingle Spin game, we’ve joined forces with the guys from the online casino bgo.com to create a fun quiz. Quickly answer the 10 quiz questions (it should only take a couple of minutes) and we’ll tell you exactly what Christmas film you should be watching. So, don’t waste any more potential movie-watching time. Take our quiz now. And if you’re looking for more ways to stay entertained over the festive season, look no further than the huge range of online slots games at bgo.com. We’d highly recommend the new Jingle Spin game. It’s sees you step inside Santa workshop, where you’ll find the jolly fella himself shooting prizes at the reels using his Christmas Bonus Wheel. Have fun playing and we wish you a very merry Christmas! When it comes to anything inflatable, the company that is the leader is no question, Gemmy. They come out with literally the best airblown inflatable products for all the holidays. Christmas has always been the big go-to for inflatables but recently Halloween has been stealing some of the spotlight with Gemmy putting out some excellent products. This year marks the 25th anniversary of “Tim Burton’s The Nightmare Before Christmas” and Gemmy has delivered four new products to celebrate. The one that we received from Gemmy to feature is a scene with Jack Skellington, Sally and even Zero. It is runs about 6 feet tall and is available at Walmart. There is also an inflatable with Jack and Oogie Boogie, that was a close second to this one. 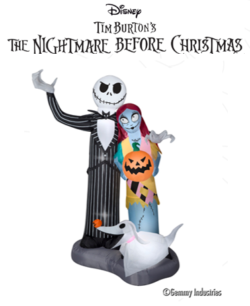 “The Nightmare Before Christmas” Jack Skellington and Sally Airblown Inflatable Scene is easily one of our instant favorites and what is even cooler is that this scene could also work well for the Christmas season as well if you are a big fan of the film like our house is. The lights are really bright on these and I love how it has a base stand around it which makes it VERY easy to display in small areas since it stands up easily. Gemmy also has great other Halloween products including a Minion Ghost (also a great purchase, I can see this side by side with the Jack & Sally scene) as well as a Bewitched Pumpkin Carriage with a Fire and Ice Projection. Easy year they are outdoing themselves with these products. I am very proud to display this product in front of my house and I see cars slow by as they pass just to get a good look at night cause honestly, it looks amazing from the street. Don’t wait head to Walmart now! “Office Christmas Party” packs some serious talent including Jason Bateman, Olivia Munn, T.J. Miller, Jillian Bell, Courtney B. Vance, Rob Corddry, Kate McKinnon, Jennifer Aniston. Kate McKinnon steals the show again like with this year’s “Ghostbusters”. The movie is rude, crude and in your face! Jokes filled through making this raunchy comedy a well rounded experience. Even though Christmas is nine months away, this film can be watched anytime and delivers some fun anti-holiday cheer. 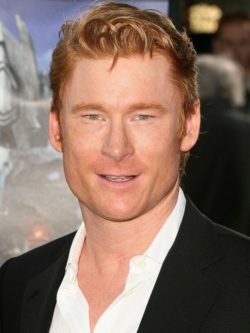 Official Premise: When an overbearing CEO (Jennifer Aniston) decides to close her hard-partying brother’s failing branch, he (T.J. Miller) and his fired up co-workers (Jason Bateman, Olivia Munn, Kate McKinnon) decide to throw an epic office party to land a big shot client and save everyone’s jobs. Fueled by booze and bad decisions, things quickly spiral out-of-control in one of the craziest nights of their lives. There are two versions of the film available to check out. There is the Unrated version of the film as well as the Theatrical. I watched the Unrated and enjoyed it thoroughly. More raunchy jokes throughout. “Office Christmas Party” comes with a combo pack including a Blu-ray + DVD + Digital HD copy. The special features are solid and worth checking out. There is a fun commentary track from the directors Josh Gordon & Will Speck. The provide some fun stories from the production. “Throwing an Office Christmas Party” is a fun behind-the-scenes look into the film. Lastly there are some more Outtakes and Deleted & Extended Scenes included. Calling Florida moviegoers, below please find the codes for the screenings of “Office Christmas Party”. If you want to see this film before ANYONE else! Hurry fast and grab tickets below and spread the word to your friends as well! They will go VERY fast! Enjoy and be sure to leave comments below after the film! OFFICE CHRISTMAS PARTY is in theaters December 9, 2016! Don a kerchief and get to the Gaylord Palms Resort to experience the astonishment of everyone’s favorite poem, ‘Twas the Night Before Christmas in nearly 2 million pounds of hand-carved vibrant ice sculptures. This year’s ICE! presented by Pepsi attraction will also feature four slippery ice slides, live carving stations inside of the Artisans in Action Frostbite Factory and back by popular demand, On the Blocks, the exclusive adult-only ICE! bar. Christmas at Gaylord Palms includes myriad offerings for every age. Guests can experience the adrenaline of Alpine Rush Snow Tubing – an 18’ 8-lane giant snow hill created with 1.5 million pounds of real Florida snow. Not a thrill seeker? How about an elf seeker? The all new The Elf on the Shelf® Scavenger Hunt ignites the inner sleuth and takes guests on a journey throughout the holiday-clad hotel. Participants will follow clues and scan the hotel to spot the 10 scout elves who have landed at Gaylord Palms. By solving puzzles and finding all of the elves, guests will reveal the elves’ names so they can report back to Santa. All families that complete the scavenger hunt will win a special prize. Once you have found the last scout elf, make your way over to the Emerald Bay Stage for the world premiere of the all-new Cirque Dreams Unwrapped. Guests will be dazzled by an array of seasonal characters brought to life in a dreamscape of imaginative costumes and creativity, while stunning feats of showmanship are unwrapped, performed on stage and in the air, leaving audiences on the edge of their seats. Broadway director and Cirque Dreams founder Neil Goldberg is bringing the famed entertainment brand to Orlando for the first time in the company’s 22 years with this exclusive show. The entire family can enjoy this uniquely inspired 25-minute Christmas dream presented with the Broadway style and inventive theatrics for which Cirque Dreams is renowned. The season’s hottest couple, Mr. and Mrs. Claus will also be a part of the festivities. Photos with Santa will take place in Santa’s Workshop located in Alpine Village and Mrs. Claus will be a part of the all-new Brunch with Mrs. Claus at the award-winning Villa de Flora. Alpine Village, the holiday attraction hub, will also feature the Gingerbread Decorating Corner presented by PEEPS ®, Snowy’s Snack Shack and holiday shopping galore. If that’s not enough, wander through the atrium’s lush gardens (over 500,000 plants) sprinkled with poinsettias, grand holiday displays, the famous 54-foot-tall majestic Christmas tree and more than 2 million twinkling lights. In addition to the holiday happenings, hotel guests can enjoy fish and alligator feedings, relax at Relâche Spa with themed-seasonal treatments, plunge into Cypress Springs Family Fun Water Park and indulge in holiday dining at our eight delectable restaurants. Whether you enjoy a filet, fresh seafood, pasta or a burger – we guarantee there is something to whet your appetite. Christmas at Gaylord Palms is open daily from November 24, 2015 – January 3, 2016, including holidays. Packages are on sale today. For more information and to purchase tickets, go to ChristmasatGaylordPalms.com. Be sure to “Like” Gaylord Palms on Facebook or follow us on Twitter to get the most up-to-date information and special deals and promotions! Gaylord Hotels® is a collection of hotels and upscale resorts that affords endless opportunities for leisure travelers and conventioneers. The brand’s hallmark—“everything in one place”—provides guests with diverse dining options, quality spa and fitness center services, top-notch entertainment, on-site shopping and endless activities. Gaylord Hotels is a pioneer in the hotel and convention industry with properties in the nation’s most desirable destinations. Gaylord Hotels include Gaylord Opryland® in Nashville, Tenn.; Gaylord Palms® in Kissimmee, Fla., near Orlando; Gaylord Texan® on Lake Grapevine, Texas; Gaylord National® on the Potomac River in National Harbor, Md. ; and The Inn at Opryland® in Nashville, Tenn. For more information, visit www.GaylordHotels.com. Over 50 million people have experienced a Cirque Dreams show in theatres, casinos, theme parks, cruise lines, and on Broadway. Now in its 22nd Year, Cirque Dreams shows have garnered the praise of critics around the country from USA Today, Associated Press and the New York Times to CNN, Today Show and Fox & Friends. Producer and Director Neil Goldberg has been declared “One of today’s leading theatrical impresarios” by The LA Times and “Uniquely ingenious” by the New York Daily News. The Cirque Dreams franchise is a globally recognized entertainment brand including, Cirque Dreams Jungle Fantasy, Cirque Dreams Rocks, Cirque Dreams Holidaze and Cirque Dreams & Dinner onboard Norwegian Cruise Line. The Elf on the Shelf ® and © (2015) CCA and B, LLC. All Rights Reserved. It’s been a “Dukes” kind of year here at Media Mikes. Earlier this summer I spoke to John Schneider about his feature film directorial debut, the tongue-in-cheek horror film “Smothered.” This week I got to speak with the other Duke boy, Tom Wopat, who recently teamed with Schneider for an album of Christmas music entitled “Home for Christmas.” Being familiar with Mr. Wopat’s work in musical theater, as well as on country radio, I was well aware of his pipes. When we chatted before the interview he was as proud as a new parent. Rolling Stone magazine recently named “Home for Christmas” one of the ten-best holiday albums released this year and the album DEBUTED in the top 10 on Billboard’s Traditional Jazz chart. It didn’t climb to #10…it opened there! In fact, as I write this the album is “sold out” on Amazon.com Don’t fret, though. They’ll make more! Mike Smith: How did this project come about with you and John? Tom Wopat: We’ve always enjoyed singing together and in the past 20 years or so we’ve done a few shows. We’ve talked a lot about recording together. I had started producing as well and this just made sense. We cut a couple of songs together last December and then we finished the rest this past August. MS: Both you and John have been very successful in the theater and in country music. Was there a reason you decided to do a Christmas album? TW: Well, for one thing it’s kind of a perennial. You’d like to think that it will sell for a while. Another part is that we can go out and do a series of concerts every year with that material so it just made sense to do that. MS: You’ve done a few shows already this year haven’t you? TW: We did several. We did a show in New York, then we did a show for about 500 people in John’s barn in Louisiana and we just did one in Atlanta. MS: It’s obvious that you and John have a great rapport. I listened to you both this past week when you were hosting on Sirius Radio. Is there anything else you two want to collaborate on in the future? TW: We’ve talked about doing a movie. John has a lot of projects he’s developing…he’s putting together a movie studio in Louisiana…so hopefully he’ll give me a call one of these days and I’ll go down there and do something with him. And I’ve got some ideas for future albums. We finance them ourselves so hopefully this one will do well so we can finance others. MS: I actually spoke with John this summer to promote his horror film “Smothered.” If Catherine Bach sings I’ll be able to talk to all of the Duke cousins! TW: (laughing) There you go! MS: What do you have coming up? Are you going back on stage soon? TW: Those things just come along suddenly…I very rarely get much lead time on that. The only thing I can plan on is some upcoming dates with my band. We’ll be on Long Island in April and in Indiana in August. But I’m sure between next Thanksgiving and Christmas we’ll have ten or fifteen appearances planned. I’m also getting ready to do another solo record and there’s talk of myself, two women and a little jazz group going out on tour and performing the music of Woody Allen films…pretty much some great standards. MS: Really? That would be right in your wheelhouse. TW: Yeah, that would be a good one. To celebrate the release of “Tyler Perry’s A Madea Christmas: The Movie”, we are happy to be giving a DVD of the film. If you want to win this great prizes, please leave us a comment below or send us an email with your favorite Tyler Perry film. This giveaway will remain open until December 19th at Noon, Eastern Time. This is open to our readers in US and Canada only. One entry per person, per household. All other entries will be considered invalid. Media Mikes will randomly select winners. Winners will be alerted via email. Madea gets coaxed into helping a friend pay her daughter a surprise visit in the country for Christmas, but the biggest surprise is what they’ll find when they arrive. As the small, rural town prepares for its annual Christmas carnival, new secrets are revealed and old relationships are tested while Madea dishes her own unique brand of Christmas spirit to all. Written for the screen, produced and directed by Tyler Perry, who also stars as Madea, the hilarious holiday extravaganza also features Kathy Najimy (HBO’s “Veep,” TV’s “King of the Hill”), Chad Michael Murray (TV’s “One Tree Hill,” TV’s “Chosen”), Anna Maria Horsford (Friday After Next, Our Family Wedding), Tika Sumpter (Ride Along, Get on Up), Eric Lively (Deep Winter, The Butterfly Effect 2), JR Lemon (TV’s “The Night Shift”), Alicia Witt (TV’s “Justified,” Two Weeks Notice), Lisa Whelchel (TV’s “The Facts of Life,” TV’s For Better or For Worse) and Larry the Cable Guy (Cars, Cars 2, Delta Farce). Since the unbelievable success of Disney’s “Frozen” last year people have been in craze for any thing from this film. With the holiday season right around the corner, it’s that time to decorate the house and I was thinking to myself, “Hey, I want a giant inflatable Olaf in the front of my house!”. Well, leave it Gemmy to deliver us exactly that. Gemmy is the company who makes most of these amazing inflatable figures that end up on many of our front lawns. They have everything from “Star Wars” to ” Disney” and everything in between. The Olaf inflatable figure figure stands at 3.5 feet tall and looks amazing when all blown up and standing tall. It inflates very quickly and with no issue at all. It uses energy efficient LED lights to conserve energy. I know it maybe been too late for this year but Gemmy should get on the wagon with Anna and Elsa inflatables as well. I would love to have a Frozen collection to celebrate the holidays. If you are a big fan of the Disney animated film, I would highly recommend this product and if you are a smart shopper you should be able to find it for below $40 bucks, which is a real steal for sure!